As if there aren't enough ways to screw in time on Facebook already, Sid Meier has announced that a new version of Civilization will be coming to the world's most popular social network next year. The Civilization Network will offer "solo, competitive and cooperative play" with friends, relatives and those complete strangers who happened to date someone you knew in public school that you run into on Facebook on an alarmingly frequent basis. 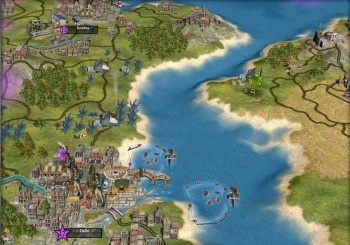 "Civilization Network will allow you to join together with your friends to create the world's most powerful, richest, smartest, or just plain coolest civilization," Civilization creator Sid Meier said. "You can coordinate your strategy to win great battles, share your technology to jump ahead of your rivals, lobby your family and friends to form your own government and win vital elections, manage and grow your cities to maximize production and happiness, spy on your enemies, and work with your friends to create the great Wonders of the World," he continued. "The game will offer everything you enjoy in Civ in a fully persistent environment - you can play as much as you like, whenever you like, and it'll be free to play." You may find this hard to believe but the prospect of free-to-play Civilization on Facebook does not make me happy. You see, I've managed to avoid Facebook thus far; I signed up for it so I can look into things like this but that's as far as it goes for me. The last thing I need is yet another pointless, addictive online timesink sucking away the precious hours and days of my life. But now Civilization is being added to the mix? That's like getting heroin in my peanut butter. Damn your eyes, Meier! A Civilization Network closed beta is expected to start "soon." You can claim your place in line by signing up for the Facebook Civilization Network page.